Subtitles in our supported languages are also available by clicking on the icon in the bottom-right corner. Not many Swedish heavy tanks made it past the drawing board. However, there’s no denying they would have turned a few turrets on the battlefield, and would've probably travelled unscathed due to their highly-sloped hull design. Fortunately, World of Tanks can make any of that a reality! The EMIL I, EMIL II, and Kranvagn are three new heavy tanks for Update 9.17's Swedish tree, and here we'll take a look at their strengths and weaknesses, plus a bit of history. A blend of tough armor and an autoloading gun turn the EMIL I into a serious threat in close combat, while its aim is decent enough to fight from the second line. Durability: Thick frontal armor, a low profile and small size make it an efficient vehicle when driving straight; it’s a difficult target to spot and hit. Be smart with its gun depression (-12°) and you’ll last longer on the battlefield. Mobility: More compact than the АМХ 50 100 and capable of reaching 50 km/h (with a cruising speed of 42–43 km/h), it can easily find a well-protected position and empty its clip, staying hidden behind hills. Firepower: Its four-round autoloader magazine is enough to dismantle almost any tier VIII vehicle, except for heavy tanks and thickly-armored medium tanks. The EMIL I empties a full clip faster than the АМХ 50 100 and doesn’t have to stay exposed long, which makes it a more universal vehicle. Decent gun stabilization on the move allows you to fire right away or after a short stop. The EMIL II can give you a nice preview of what lies ahead on the tree. This tier IX shell-bouncer is designed for uneven terrain and sneak attacks. However, the full potential of Swedish heavy tanks opens up at tier X, with the flat-hulled, durable Kranvagn. Durability: The Kranvagn sports thicker armor than the АМХ 50B and T57 Heavy: a highly-sloped hull (90mm), an even better-protected turret (210mm) with sloped armor, small hatches, and a tough top. Its relatively small profile, flat hull and gun positioning in the turret further boost its survivability. You’d have to be a crack shot to hit its turret, which, together with its highly-sloped armor, makes it a truly durable vehicle. Mobility: The Kranvagn has good cruising speed, and horsepower to overrun the T57 Heavy. In sports, the American T57 Heavy would be a champion racewalker, the French АМХ 50B an excellent sprinter, and the Swede a long-distance runner. Firepower: The Kranvagn mounts a 120mm gun with armor-piercing rounds, great for sending moving targets back home. Though reload is slower than the AMX 50B and T57 Heavy, the excellent gun depression (-12°) pretty much offsets that. It also lets the Kranvagn deflect enemy shells (if angled correctly) and abuse uneven terrain to pick off enemies. 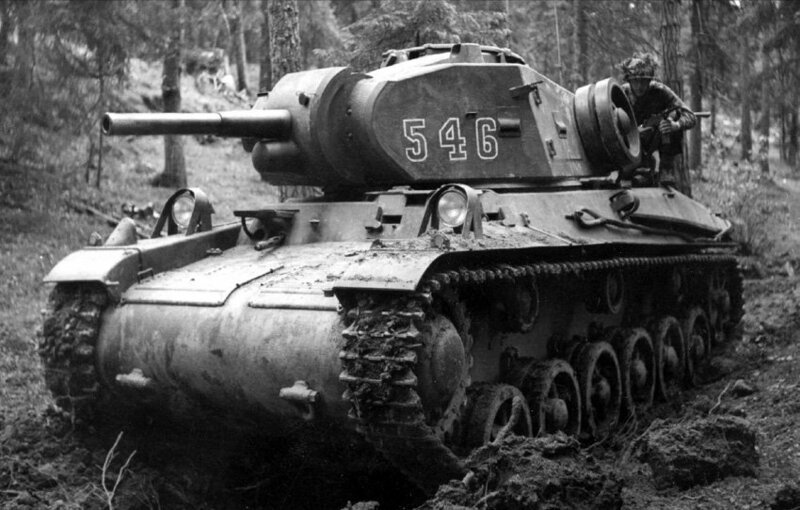 The Swedish army did not use the classification “medium tank” for its own vehicles during WW2. The armored brigade (yes, there was initially just one) had light tanks and heavy tanks. Light tanks included the Strv m/37, m/38, m/39, m/40 and m/41; the “heavy” was the Strv m/42, which at 22.5 tons was lighter than most medium tanks. Though the army wanted strong guns and armor, it simply could not accept a tank any heavier than the Strv m/42 at the beginning of the conflict. The main reason was concerns about strategic mobility. The army had no experience with heavy tracked vehicles and feared the country's limited infrastructure wouldn’t be able to support heavier tanks—when the Strv m/42 entered service, it was already more than twice as heavy as the tanks in service. Surveys of road bridges indicated that only maybe half of them would be able to carry a 22-ton vehicle without damage. Naturally, an enemy would suffer from the same problems, and thus a heavier tank would not really be necessary. After the war, the army realized that heavy tanks really didn't have as many problems in rough terrain, and it also became apparent that tanks were best fought with tanks of your own. A tank that could fight what the potential enemy had on equal terms was required, and now needed to offer reasonable NBC protection. Work on the “heavy” project began in 1949 with 18 tank concepts created in the 1950s, all designed to counter the Soviet IS-3. Upon discovering the enemy’s main weakness (weight), the Swedes focused on creating a heavy tank that would weigh less, choosing a lighter, oscillating turret design over the IS-3 classic turret setup. 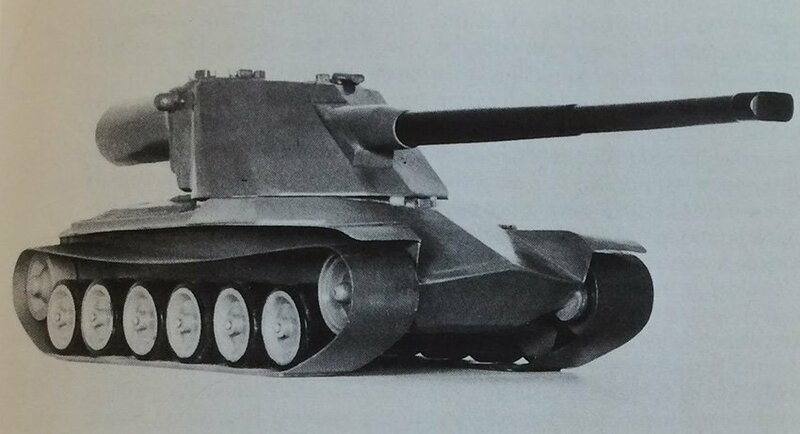 Using the French AMX 50B as a base, the new tank concept allowed two autoloading guns to be mounted, which would give it an upper hand in combat by saving its crew a few precious seconds they would spend changing ammo. Regardless of how it looked on paper, this very original turret design would eventually cause the shutdown of the “heavy” project in 1954. After the war, there was some uncertainty of the future of the tank. The army realized that the Strv m/42 was now so thoroughly obsolete it was useless for anything more demanding than shooting HE at infantry. A modern tank was needed, and the Centurion could be delivered immediately. The purchase was made very quickly, with hardly any evaluation, and the domestic “heavy” project that had basically the same goal was then given a lower priority and eventually cancelled. While Swedish heavy tank concepts never rolled out to the battlefield, the “EMIL” project contributed to the country's tank engineering industry with several interesting and original designs. That's all for the Swedish heavy tanks. Make good use of this info when they roll out, and stay tuned for a detailed profile on the upcoming tank destroyer branch. Want a hands-on look of Update 9.17? Join the Public Test—there's more than just Swedish tanks to sample!